Beefeater picked up a large ball and placed it on an 8-foot goal. It could also pull goals around the playing field. The robot’s strength was its arm. The driver wore a backpack. Beefeater’s arm mimicked the arm of the driver! The most unique feature was the arm of the robot. 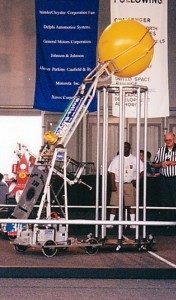 The 710 match at the Midwest Regional is definitely the favorite memory for 2001! Cyber Blue 234 received the National Driving Tomorrow’s Technology award.